Note: A version of this article has also been published at the Globe and Mail. READ HERE. Some years ago, I had the opportunity to take a course with Dr. Chris (Christopher) Peterson, one of the founding pioneers of the positivity movement and a well-respected professor of psychology at the University of Michigan. A year later, Chris passed away quite suddenly. While his loss was immense, he left behind an extraordinary legacy to the study and practise of wellbeing that touches nearly every aspect of one’s life – including the landscape of career and work. Chris’s trademark phrase was: “Other People Matter”. These three words were foundational to his vast body of work and what he stood for and inspired in others. What does this have to do with work? Everything. “Other people matter” is far more than a slogan. It’s a mindset, a stance, and a way of being. Appreciating, connecting, and relating well with others is foundational to our personal, professional and organizational wellbeing. It’s no secret that Canadians are stressed. A study by staffing firm Accountemps indicated that 58 per cent of Canadians say they are stressed every day at work. 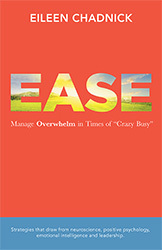 Of course, heavy workloads, escalating change, disruption and uncertainty all contribute to stress. But equally salient, are the relationships, the conversations, and the overall dynamics people experience at work. Aka, the people factor. People need to connect, to be understood, to be appreciated — to thrive and bring their best to their work. I have a lot of conversations with people about their work. Often their discontent is connected to a relationship dynamic at work – or lack thereof. They work hard but aren’t getting enough meaningful time or dialogue with their boss or others at work. Or the conversations they do have leave them feeling like a hard-working ‘widget’ yet under-appreciated as a human being. Recently I spoke with a woman who had been going through a tough time. She had lost a close family member and had also been coping with some health issues of her own. She’d been transferred to another department and despite her personal challenges, she showed up to work and gave it her full attention and effort. She had always had a stellar track record of solid performance and fostered great relationships, but she was feeling frustrated. Her boss, she said, was relentless in checking in on project issues but never once asked her how she was doing or acknowledged the successes she did accomplish despite this challenging time. In this feeling of disconnect, she was increasingly feeling a level of unhappiness at work that she’d not had before. Was it the new job? Not really. It was her boss. She wasn’t connecting with him. Making others feel valued, appreciated, and understood is one of the most powerful acts of humanity and kindness that one can show. In good times and especially the tougher times. Years ago, I worked with a leader who believed that personal matters and related conversations should be left for home and that work should just be about business. This individual was sent to me for some coaching because his CEO felt he lacked people skills and he was failing to make connections with his colleagues and other important stakeholders. He was smart and capable in his professional ‘skills of the trade’ but his relating skills were poor. He was at risk of derailing his career if he didn’t shore up. We worked together to help him become more comfortable in connecting with others authentically and creating better relationships. Getting the job done always matters. Technical skills count and will increasingly be even more important. But, human skills matter too. The ability to connect, care, communicate may not sound like rocket science but these abilities are crucial. People often refer to these abilities as ‘soft skills’. I don’t think there’s anything soft about them. Healthy workplace cultures can’t be designed or prescribed from any one department or one initiative. Everyone has a stake and a responsibility. Recognizing that ‘other people matter’ is a good start to inspire behaviour that can build better cultures – one conversation at a time. Despite all the talk about robo “this and that” and the related disruption at work, humans are still showing up to work. Let’s remember what it means to be human before it’s too late. Do you take time to connect and get to know others at work – even just a little and outside of the details of their functional role? How well do others see the real you at work? Authentic leaders generate more trust from others. Trust generates better outcomes all around. Share a little bit more about what makes you ‘you’. In meetings do you tend to dive in to business immediately or take a moment to acknowledge people and connect? While waiting, are you buried in your phone, or do you talk to others? If you think small talk is a waste of time – think again. Authentic, small talk can help others connect and find common ground. This creates more productive, trusting relationships. Where do you prioritize your attention? There’s a lot competing for our attention. Do you skew yours almost exclusively on the project and tasks side of managing or do you also put ample attention on the people side of your work? Leaders who balance this attention get better results. Do you support others when they falter? Or judge? When you make a mistake (come on, everyone does now and again), do you hope others will show compassion and give you the benefit of the doubt? Do you think kindness and compassion have a place in the workplace? If so, how do you acknowledge this and what does that look like when you and your team are at their best?